The fiction of a video game's universe is fertile ground for novels, sprouting dozens of books annually that tap into gaming's beloved and unknown back stories. Few though have had to tell a story in a universe almost completely controlled by the gamers themselves, the very people most likely to read those novels. That's what confront the authors of Eve Online's novelized fiction. And the way the deal with it can have some surprising consequences. The virtual universe of online computer game Eve Online is a thriving, thrilling place of starship fights, rampant piracy, militant corporations and financial espionage. The game's hundreds of thousands of players assume the roles of characters who fill every need in the game, controlling miner, trader, pirate and CEO. More interesting, though, the players have almost total control over the lifeblood of the game: Its economy. The result is a sometimes vicious environment of intrigue, racketeering and politics. And it's up to the developer's creative writing team to at times turn this unordered chaos into a living space opera. Two among the team have also used it to craft novels. Tony Gonzales' Eve Online: The Empyrean Age was released in 2008 and Hjalti Danielsson's Eve Online: The Burning Life is due out this fall. And the authors took very different approaches to their work. The Empyrean Age was used to tell the story of major events that took place in the game's universe as part of an update released for the game at the same time. "My task was to tell the story about how this great war comes to pass-describing what was happening behind the scenes, and the choices that leaders of nations faced before committing to such a grave undertaking," Gonzales told Kotaku. Gonzales said that early on publisher CCP Games decided not to include any of the many influential players or their character creations in the novel. "Though tempting, the fact is that doing so would have been an unnecessary risk and thus inappropriate for the (game's) first foray beyond gaming into the greater science fiction community.," he said. 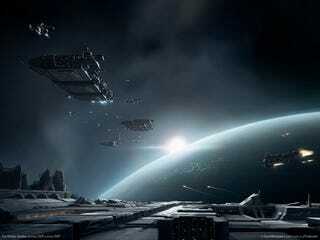 "The main reason is because EVE Online has incredibly competitive gameplay. Player actions of a scale considered momentous enough to build a novel plot around tend to happen at a direct and often unpleasant cost to other players. " And the history of conflict, in both the real world and the fictional, always has at least two sides: The victor's is the one most commonly told, he said. So instead, The Empyrean Age took the "golden path." "We can, for example, speak of aggregate player actions in broad strokes.," he said. "We just need to find a way to tell that story accurately and fairly, and more importantly establish that there's an audience eager to read about it." Danielsson said that to narrow the focus of the book he made lists of everything he wanted to use from the game and prioritized them. "There was no way I could pick just one setting and one story to tell," he told Kotaku. "Instead, I had my characters go on a journey through the EVE cluster, encountering people with very different backgrounds and attitudes along the way, and chronicling the life in all those places." And while Danielsson, like Gonzales, didn't overtly use any player history or actions in his book, he said it's hard to avoid. "There is the lore that we create and the lore the players create, and a myriad of overlaps between the two," he said. "There is a feed there, back and forth, that the novel plugs into. " Creating fiction in a fictional world not totally controlled by the author can have its challenges, Danielsson said. "It's immensely challenging," he said. "A novel is static and can only reflect the game world at a certain specific point - and parts of EVE go through some pretty big changes at times, but it must nonetheless be timeless enough that it can be enjoyed a year later, three years later, and so on." With the emergent storytelling that naturally sprouts from games like Eve Online it begs the question, when will game-based novels write themselves? "Novelizing direct player actions would be almost exclusively historical and investigative reporting," Gonzales points out. "In fact, a novel probably isn't the best way to tell their story. But a dedicated history of player actions, especially if it included all the interesting externalities and accompanying social dynamics, might be a compelling tale on its own without any author-added role-playing elements to turn it into space opera. " "If we can prove that the audience for this is there, we're definitely willing to pursue it."